Director Vignesh Shivn after his massive hit Naanum Rowdy Dhaan was set to begin his next, Kaathu Vaakula Rendu Kaadhal (KVRK) with Vijay Sethupathi, Nayanthara and Trisha. But reliable sources reveal that the director would commence KVRK next year. It is also announced that the Naanum Rowdy Dhaan director would begin his next with Suriya (Suriya 35) under Studio Green production banner. As regards KVRK, sources state that the project is definitely on as it is close to the director’s heart, but is just a little postponed. 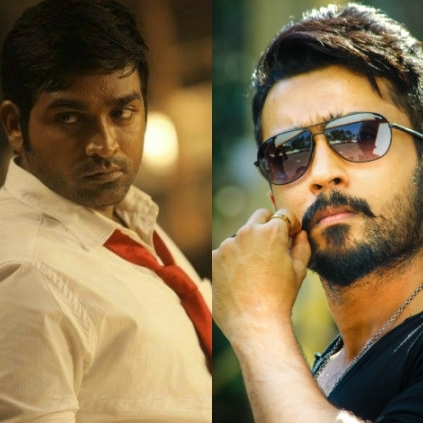 Vijay Sethupathi is also currently working in KV Anand’s film and hence is expected to join KVRK after this. Official announcements regarding the heroines and other cast details of Suriya's project are expected to be announced soon. Stay tuned! Official word: Suriya signs his next! Interesting latest addition to this year's Diwali race! Burma, Jackson Durai and …. People looking for online information on Kaathu Vaakula Irandu Kadhal, Suriya, Suriya 35, Vignesh shivan, Vijay Sethupathi will find this news story useful.